Shrimp is one of my favorite things to eat. I just love the taste. Growing up shrimp cocktail was a must have at any special meal/event. Now whenever I have shrimp I think something special is going on. I have expanded my horizons from shrimp cocktail in the recent years. Now it is one of my go to items to cook with. This is a meal we threw together in less than 10 minutes last Friday. Fridays are always hard for us to pull a meal together after a long work week and groceries are at the minimum in the fridge. I used a thawed bag of frozen shrimp which I stock up on when they go on sale at the store. Melt butter in large skillet on medium heat. Add shrimp, garlic, green onion, garlic powder, parsley and pepper; cook and stir 3 to 4 minutes or just until shrimp turn pink. Stir in wine or lemon juice and cook shrimp an additional 2-3 minutes. This week has been all sorts of crazy. The weather was cold, then hot, rainy, foggy, and now it is getting cold again. Mr. J left super early Monday for a week long work trip. I left later in the day and made my way to the Midwest. Breakfast was at the hotel. Coffee. Fresh fruit. Omelette with spinach, onion, green peppers, sausage and cheese. The potatoes were my downfall. Lunch was at Panera. It's almost like my second kitchen. I went with my go to broccoli cheddar soup, chopped chicken cobb salad with avocado, and a whole wheat baguette. I forgot to snap dinner but that was some flat bread tomato and mozzarella pizza and a small Caesar salad with dressing on the side. By then, I just wanted to be at the airport and on my way home. It made the meal ho-hum. Instead I leave you with our Saturday outing to a local Indian restaurant that has a lunch buffet. Amazingly delicious! Dinner was followed by a 8pm latte. This was both the best and worst decision. I got home very late and this helped keep my up for my drive at midnight. Problem being that once home, I was pretty awake. I then decided it would be best to unpack, paint my nails and go through the mail before finally hitting bed. I am currently reading the biography, Dearie, of Julia Child. I have all sorts of books that I need to post about. Although not a resolution for the New Year, I am trying to eat less. The holidays got a bit out of hand. Pants were a little snug. I just didn't feel great. Something that was fairly obvious to me was our portions. Big as in could easily feed two people big. Now I don't like to deprive myself. Cutting out sweets is just not an option. However, along with downsizing pretty much every helping I take. 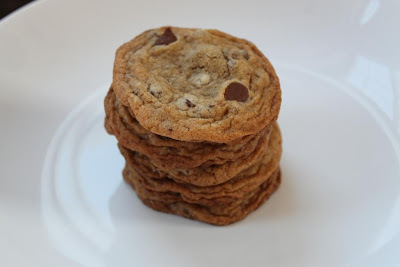 You know, putting less on the plate to begin with, leaving the serving dishes in the kitchen, and not taking a second helping, I have also only been making 5 cookies at a time. Five cookies makes us through two days. One cookie a day for me. An extra for Mr. J. Of course he supplements with other goodies and snacks. So yes, I still eat cookies. I just make sure there are few cookies there to eat. The rest of the dough balls are bagged up and put into the freezer for another week. Working with a stand mixer fitted with the paddle attachment beat the butter at medium speed for about 1 minute, until smooth. Add the sugars and beat for another 2 minutes or so, until well-blended. Beat in the vanilla. Add the eggs one at a time, beating for 1 minute after each egg goes inches Reduce the mixer speed to low and add the dry ingredients until incorporated. On low speed mix in the chocolate. Bake the cookies for 10-12 minutes, or until they are brown at the edges and golden in the center; they may still be a little soft in the middle. Pull the sheet from the oven and allow the cookies to rest for 1 minute, then carefully, using a wide metal spatula, transfer them to racks to cool to room temperature. 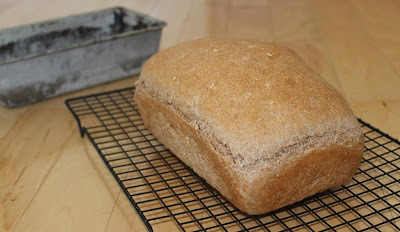 It seems like a very long time since I have posted a recipe for The Secret Recipe Club. We took off the month of December for the holidays but we are back again this month. I was assigned Kirstin over at Loving Life. 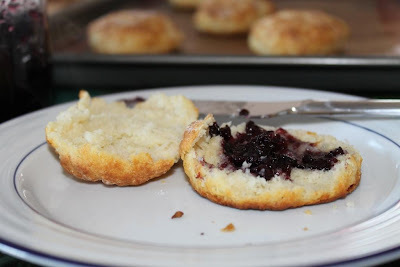 Although she had several tempting soup and cookie recipes I saw these biscuits and suddenly I was craving eggs, bacon, and strawberry jam. Mr. J was going to be gone for a while with work so I thought the perfect send off would be a big Sunday breakfast complete with homemade biscuits. The recipe calls for dropped biscuits but like when Kirstin posted I cut them out. I don't have biscuit cutters so I just used a glass. I baked up 5 right away and frozen the rest in a Ziplock freezer bag for a later date. 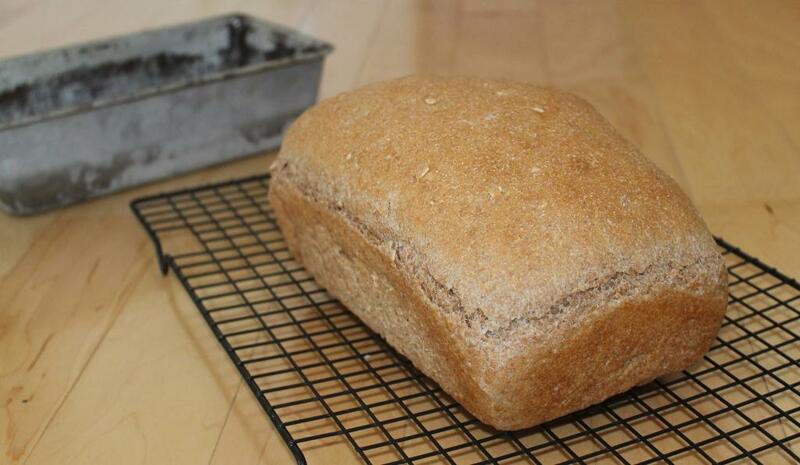 Combine flour, sugar, salt, and baking powder in a large bowl. Cut in shortening until crumbly. Combine milk and sour cream and stir into flour mixture. Add about 1/2 c more flour and then dumped it onto your working surface. Knead in extra flour, folding over several times. Roll it out and cut with a 3 3/4" cookie cutter or about the same size glass. Place on a greased or lined cookie sheet and bake for 10-12 minutes. This weekend I did a whole lot of nothing and it was fabulous. Last week I was jumping from place to place and didn't have much time to relax let alone get anything productive accomplished. After a bit of cleaning and grocery shopping, I gave up and just let go. A pretty hard task for me I must say. We watched two movies. Safe House is with Denzel Washington and Ryan Reynolds. It was a pretty intensive movie about the CIA. The Words starred Bradly Copper. There was a lot going on in this film and I kind of want to see it again just to make sure I didn't miss anything. That always happens to me with movies that go back and forth in time. Watching these movies on our 10 plus year old TV makes us think it could be time for an upgrade. Maybe before the day is done?!?! A year and a half ago I bought a Canon Rebel T3. I used it for a few months and then reverted back to my little Canon Powershot. It seemed so much easier and quicker to use. For months now I have wanted to really start using my DSLR but work, life, holidays got in the way. One of the things I did around New Year's when I was stuck in the house with little energy was play with my camera. I read about half the manual. It was pretty boring but it did help define some of the features that I was vaguely aware of. Having it close by as I messed with all of the settings reassured me that I wasn't going to screw the whole thing up. I always told myself that the Powershot was a good quality camera too but looking at these photos I think I was a fool. The DSLR is way better quality. So here are the muffins. Healthy with yogurt. Sweetened with raspberries and chocolate. Oh so good! Preheat the oven to 350°. 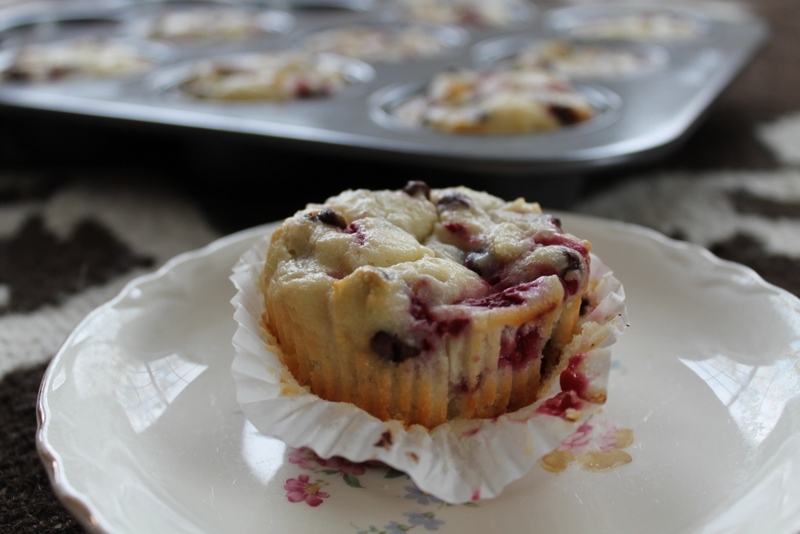 Lightly grease muffin tins or use paper liners. In an electric mixer fitted with the paddle attachment, cream together the butter, sugar, and vanilla on medium-high speed. Sift the remaining dry ingredients together in a bowl. Add 1/4 cup yogurt to the butter mixture, then half of the dry ingredients, mixing and repeating with the remaining yogurt and remaining dry ingredients until the batter is combined; be sure to end with the dry ingredients. Fold in the whole raspberries and jam until evenly mixed. Spoon the batter into the muffin tins, filling them to the top. Bake for 25-30 minutes and a toothpick comes out clean. Somehow I cannot believe it is Wednesday. And this is coming from a girl who on Monday thought it felt like Friday. I tell you, some weeks you just long for the weekend right from the beginning. Eating this week has been minimal after all of our meals out in California last week. Breakfast was a simple cereal with Cracklin' Oats. It tastes like oatmeal cookies and is always a treat. We had boxed mac and cheese, steamed broccoli and some left over chicken from a store bought roasted bird. Simple, simple, simple but very good. Dinner was slow cooker carnitas. You just have to love throwing something in a pot in the morning and having a delicious meal waiting for you come dinner time. This recipe was so simple and super yummy. 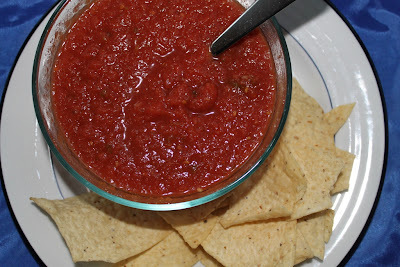 We topped it off with some of this salsa that is from a copy cat recipe from Chili's. I don't eat there often but I love the chips and salsa. Best. Snack. Food. Ever. There seems to be a day dedicated for every food these days. And I always feel like I am a day behind. National Spaghetti Day was at the beginning of January. Although I didn't know about this ahead of time I happened to have planned a spaghetti dinner for that night. When I travel for work, I buy vegetables that I think Mr. J will eat when I am gone. He doesn't. 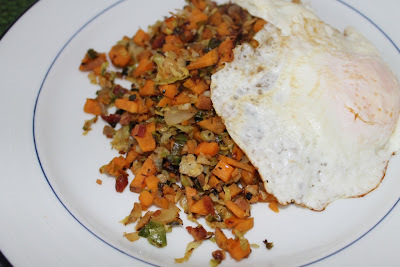 This dish was a way to use up some of those carrot and celery sticks that weren't eaten. I wanted some greens and added sauteed kale to my plate. Heat a tablespoon of olive oil in a large, deep skillet on medium heat. Once hot a, sauté the onions, carrots, and celery pieces until soft and slightly golden. Add in the garlic. Cook for 1-2 minutes. Pour in the can of crushed tomatoes. Season the sauce with the dried herbs, salt, and black pepper. Stir, cover and reduce heat to simmer for 15 minutes. Right before serving add the half cup of Parmesan. 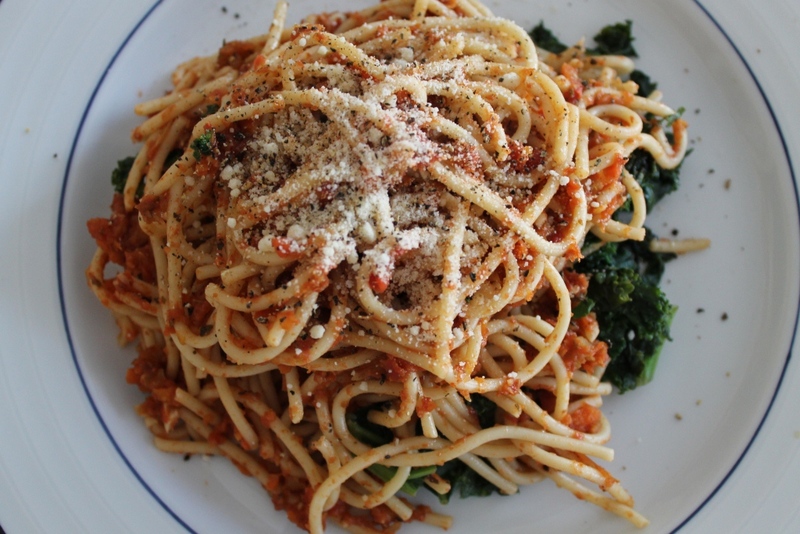 Serve over pasta and kale (optional). Top with remaining Parmesan. My brother and his wife lived in Southeast Asian a couple of years ago. One year for Christmas I asked for foodie things. Spice, dishes, etc. from the area. They succeeded in getting my a lovely dish set and a handful of Thai spices and curries. Somehow the spices got pushed aside and to the back of the pantry. Not hard to do when you have a narrow but very deep food cabinet. After some January resolution cleaning they were found. The green curry paste had an easy chicken recipe on the back and we decided to make it up right then and there. Although these were "real" Thai ingredients, you can find all of the ones for the recipe pretty easily in the US. We swiped out eggplant with green peppers and tomatoes and it turned out great. We liked it so much we made more of a soup to enjoy more of the sauce. It is a bit spicy. If you want something a bit more mild just adjust the amount of the green curry paste. Heat 1 Tbsp vegetable oil in sauce pan. Add green curry paste and cook stirring constantly until an aroma develops then lower heat. Add coconut cream and 180ml of water into pan. Continue stirring and bring to boil. Add sliced chicken, green peppers, tomatoes, and kaffir lime leaves. Then add fish sauce and sugar. Simmer until cooked through. Garish with fresh basil. Serve over rice. Note: The measurements on the packaging were in grams and milliliters. I used one can of coconut milk, not cream. I measured the liquid in 1/2 of coconut milk can. I used 2 large chicken breasts. The kaffir lime leaves can be found at many natural food stores and Asian markets.